Living in the colder areas of the world can sometimes be a strain on your gardening sanity. 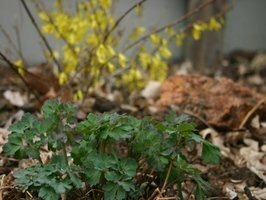 Planting early emerging perennials is a good way to quell your winter blues as you can watch them pop up before everyone else in the spring. The following is a list of plants that would qualify as early emerging perennials in Zones 4-6, especially areas with drier climates. Luckily for gardeners in cold regions, there are a slew of perennials, shrubs, vines, and even herbs that peek through the mulch early. Let's qualify "early" as anything that emerges from the end of February to the end of March. For most cold-zoned gardeners, this can be a full eight weeks before the last frost -which makes these plants a very welcome sight in a long winter. The estimated time of emergence listed are general guidelines for Zones 4 through 6, but may vary according to plant location and your specific microclimate. All of the photos in this article were taken during the month of March, with the exception of the Apeldoorn Tulip which was taken in late April. Comfrey - Symphytum officinale 4 - Late March/Early April Though it has been known to be invasive and somewhat toxic, comfrey is a staple in many herb gardeners' beds. It shows up in early spring to begin growing its thick, textured leaves which can be used medicinally or as a compost accelerator. Rue -Ruta graveolens 4 - Mid March Rue is loved for its ferny foliage which emerges in early spring. It is said to be edible as well as used in tinctures. Some people are especially sensitive to the plant's leaves which can cause photodermatitis when touched and then the skin is exposed to sun. Its main benefit in the garden might be its popularity among swallowtail caterpillars as a host plant. 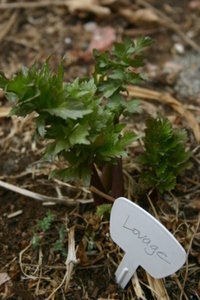 Lovage - Levisticum officinale 3 - Early/Mid March Lovage is a large growing perennial herb known for its celery like flavor. It can be substituted in any recipe for celery and its hollow stems make it a fanciful "straw" in a bloody Mary or the like. It can be invasive is left to seed and it also spreads underground by itself. Bronze Fennel - Foeniculum vulgare 'Purpureum' 4 - Mid March/ Early April Bronze fennel provides a lovely, dark contrast in the garden with its feathery leaves. Fennel has a licorice smell when crushed or chopped and used in recipes. It is also a popular host for caterpillars. Catnip - Nepeta cataria 3 - Mid March Although some might consider catnip to be invasive, it can be a great plant for a dry, neglected spot in the garden. It is mostly grown for its leaves for feline-fun, but it also blooms non-stop through the summer. 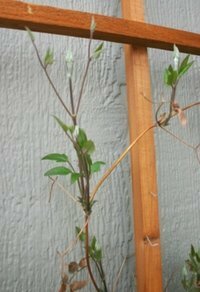 Dappled Willow - Salix integra 'Hakuro Nishiki' 4 - Late February/ Early March A beloved, underutilized shrub, which can also be trained as a small tree, the dappled willow is an excellent foundation planting in the garden. 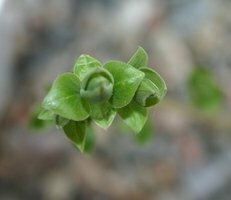 Its leaves emerge bright green in late winter along with small, inconspicuous blooms. As the leaves mature they take on a heavy white variegation. In winter the branches are a striking shade of red, making this plant a pleasure in every season. Lilac - Syringa vulgaris 3 - Mid to Late March An old timey favorite, the common lilac is a standard for a reason. In cold climate, nothing is quite like the pervasive, sweet aroma of lilacs blooming in late spring. 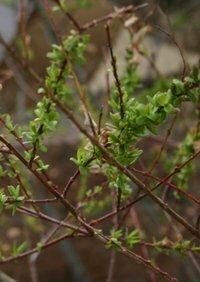 In very early winter, these shrubs will begin to put out new green growth on circuitous branches, which to many people is the first sign of spring. Wormwood - Artemisia 'Powis Castle' 5 - Early March Wormwood, or artemisia, provides a grayish-silver foliage contrast that few other large shrubs can offer. The leaves are feathery and dense, making the plant an excellent background for smaller perennials or an accent plant for a dark house. Forsythia - Forsythia 4 - Late March/ Early May Though the foliage is not early to emerge, the bright yellow flowers of this shrub are plenty to write home about. 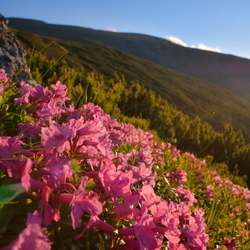 The flowers emerge from late March through early May, depending on variety and location. If lilacs don't do it, forsythias will surely tell you spring has arrived. 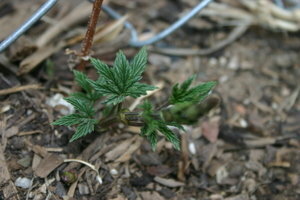 Golden Hops - Humulus lupulus 'Aureus' 4 - Late March/Early April Hops are an excellent background vine with leaves that emerge dark, textured green and mature to bright chartreuse. The thick, hairy leaves emerge in early spring and in mid summer showcase even brighter green, papery flower bracts. The vine does best in full sun and will survive a variety of soils. Clematis - Clematis 3 - Mid March There are many different cultivars and species of clematis available that will do well in almost any location or region. 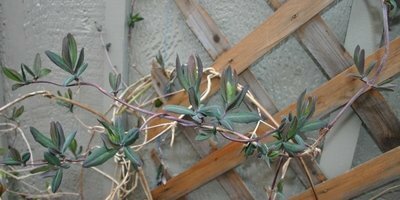 The fuzzy green-gray leaves begin to emerge in early spring, and quickly begin to climb and grow heartily. Clematis offer a range of bloom colors and are an excellent accent vine in the garden. Silverlace Vine - Fallopia baldschuanica 4 - Mid March Silverlace vine, though sometimes invasive or over-bearing, provide early spring green and a summer of dense green coverage. It will do well in almost any location and can thrive with neglect. The airy white blooms through summer are an added bonus. Honeysuckle - Lonicera x heckrottii 'Gold Flame' 5 - Early February/ Early March Gold flame honeysuckle is a vigorous grower and starts out the spring with a bang. The leaves are rubbery and dense protecting them from frosts as it emerges early in spring. Though the vine is prone to powdery mildew, in locations with dry air the problem is not terminal. The best part about the gold flame honeysuckle is its long blooming season which lasts from late spring through fall. 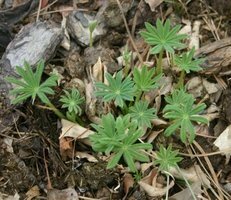 Lupine - Lupinus polyphyllus 4 - Early March Known for their penchant for cool weather, lupines thrive in early spring. Sprouts of well-formed leaves in early March are followed not long after by spires of showy blooms. Lupines are easy to start from seed or find in plant form, but are sometimes difficult to grow until well established. Delphinium - Delphinium 3 - Mid March Delphinium are sometimes tricky to grow because of their tendency to bloom themselves to death. If you can find a balance between flowering, seed setting, and deadheading, delphiniums are an excellent perennial for cool climates. Their feathery foliage emerges slowly in early spring followed by fast and tall growth with resulting summer and fall blooms. Blanket flower - Gaillardia x grandiflora 3 - Mid March Drought and heat tolerant, the various blanket flowers available consistently emerge in early spring. The tough fuzzy leaves will peak through the mulch in mid March and bloom throughout the summer. There are many spectacular new introductions of blanket flower in recent years, but the most reliably hardy variety is still G. grandiflora. Lady's Mantle - Alchemilla mollis 4 - Early March Known mainly for its velvety texture and "waterproof" leaves, lady's mantle is early in the spring to emerge as well as bloom. Though the blooms are not spectacular, the seed produced can make the plant somewhat invasive if left unchecked. The plant is somewhat picky about soil conditions, but does best in a moist, shady environment. Peony - Paeonia lactiflora 2 - Mid March A spring classic, the peony is a welcome sight when the small red shoots appear in mid spring. Peonies don't like to be crowded in the garden but if happy will come back for decades upon decades. The flowers come in a wide range of colors and to boot are fragrant. 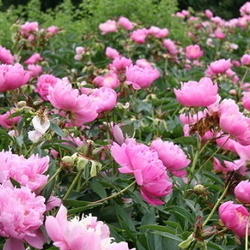 Peonies are one of the best benefits to gardening in a cool climate. Lungwort - Pulmonaria 4 - Mid February Lungworts, though not known for their showiness, are an early spring wonder. 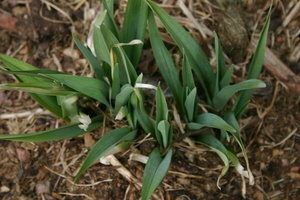 Their foliage emerges in late January or February and begins blooming soon after. 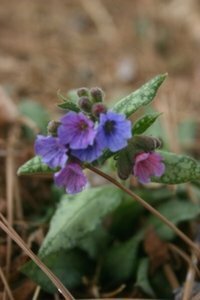 The speckled foliage provides an interesting spot in the spring shade garden and the flowers will late through snow and hardy frosts. Daylily - Hemerocallis 3 - Late February/ Early March Daylilies are a sure staple in almost any garden. Their grass-like, strappy foliage emerges very early in the spring and sometimes stays evergreen throughout the winter depending on type. The assortment of colors, size, and new introductions makes this one a perennial favorite. Garden Phlox - Phlox paniculata 4 - Mid March With fragrant panicles of blooms throughout the summer, the garden phlox makes a nice border perennial. It emerges in mid March if well mulched through the winter and begins blooming in mid summer in a variety of colors. Oriental Poppy - Papaver orientale 2 - Mid March The large red or pink blooms of the oriental poppy are striking amongst the summer and fall garden. 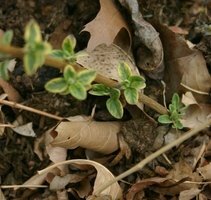 The foliage emerges small yet strong in mid March reliably and seems to thrive on neglect. Oriental poppies resent being transplanted, so do it when they are young or sow them in their intended location. Columbine - Aquilegia 3- Mid February Sometimes columbines stay evergreen throughout the winter, but if they don't, they are very early emerging in spring. Columbines look to be very delicate with fern-like leaves and slight flowers, but in fact they are very robust plants. Columbines come in an assortment sizes and color combinations and will thrive in full sun and part shade. Crocus - Crocus 3 - Late February/ Mid March There are many different varieties of crocus that are all a welcome sight in the garden's "off season." 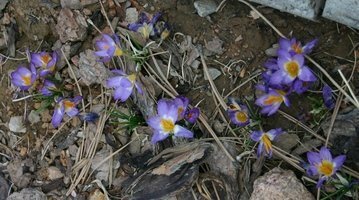 Some crocus bloom in fall while others, such as the Dutch crocus pictured above bloom in early spring. 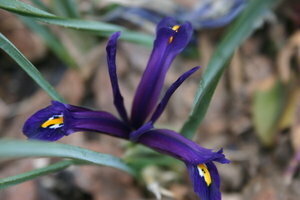 Their tiny cool-hued blooms seem to sneek up in the garden and provide an oasis of color amongst snow or mulch. Reticulated Iris - Iris reticulata 4 - Late February If you don't grow reticulated iris and you are only going to buy one plant on this list, it needs to be this one. 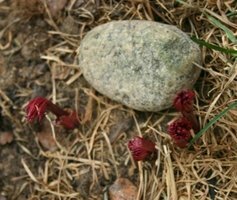 I. reticulata come up and bloom before most plants send up any green. Its deep purple, delicate flowers are deceivingly tough and will bloom through frosts and freezes. Daffodil - Narcissus 3 - Late March/ Mid April Daffodils, a garden bulb classic, are loved for their early foliage and blooms and are sometimes considered the harbinger of spring. The plants are larger than the two previously listed plants, which makes them a bigger statement in the garden. There is a wide range of color combinations, size, and blooming times. 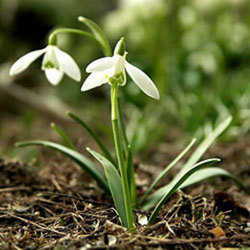 They can be naturalized in a woodland setting just as well as the focus of a traditional garden. Tulip - Tulipa 4 - Late March/ Mid April One doesn't have to ruminate over the beauty and worthiness of tulips. The range of colors available along with size and bloom time variation makes them a staple in any spring garden. If you don't already grow many of these plants, I hope you can put them on your to-find list this year. If you do grow some of these plants, go outside and peek under the mulch or snow to see what you can find! Happy spring to you all. I garden in beautiful Colorado Springs, half a mile from Garden of the Gods. Since we bought our first house two years ago, I have been busy revamping my 1/4 acre of ignored decomposed granite. 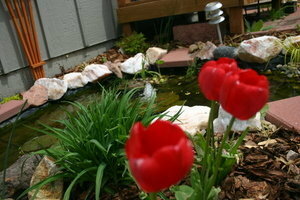 My garden passions include water gardening, vines, super-hardy perennials, and native xerics. By day, I am a high school ceramics teacher as well as a ceramicist and painter.